One of the most tiresome aspects of crypto is the continued importance placed on experts from other fields lining up to denounce the space as being for idiots who will lose all their money or would be criminals who just want to launder their money/buy drugs with it. Mention that these people don’t know what they’re talking about and you are met with a aghast glance; you are not allowed to disagree with these rich or famous people. But every comment they make is a refrain anyone who has been interested in crypto for a while has already heard. There is no originality, no new information. It is the same tired and outdated misconceptions that we have all been subjected to for years. They have their own ideological beliefs for dismissing cryptoassets and often the underlying technology completely which no reasoned argument will ever change their mind on. But that does not mean I have to treat their views as insightful or lend any weight to them. This week four high profile reports came out, as Nouriel Roubini debated with Ethereum co-founder Joe Lubin and the trio of Bill Gates, Warren Buffet and Charlie Munger appeared together on TV in an interview which discussed the nascent space. Roubini went on the offensive in the debate, in a rant that forced the moderator to have to blow his whistle to a bid to stop the rambling 'Dr Doom' from a continued assault. Looking at his prior words on the subject, this should not be a surprise, as he has been a continual outspoken critic of Bitcoin and blockchain in general. 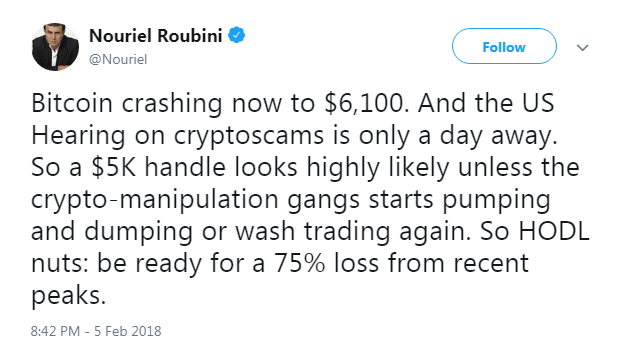 I’m not even sure what the hysterical Roubini is wittering on about here. There is perhaps no pure decentralisation but very few technologies were perfected instantly. Bitcoin remains an achievement for what it stood for and what it solved. That it has been co-opted by mining cartels exposed a flaw, certainly, but it is not a fatal flaw nor one that can’t and won’t be improved upon in the coming years. Few would deny it exhibited signs of a bubble, but the history of the still young project so far has shown that it would be foolish to assume that that is the highest Bitcoin will ever reach, especially when we consider the improvement in support services and the rise in the public consciousness. 75% loss? Oh no. Crypto is so unused to that kind of drop. And superb analysis, given Bitcoin never actually fell below $6k and has subsequently recovered to near $10k again. Note the angry language used - maybe he wouldn't be so irate if he'd invested in 2014 when he noted that it wasn't safe owing to the hacking of it (presumably referring to an early hack of Bitcoin which was resolved quickly and has never been repeated - there are few technologies that have only had one hack in a decade of operations). Bill Gates is one of the more perplexing cases. Initially very optimistic about Bitcoin, he has since changed his mind and recently stated that “I would short it if there was an easy way to do it.” Exposing his lack of knowledge around the subject, he was quickly reminded that of course there is an easy way to do it. As for his comments that “you are not producing anything and so you shouldn’t expect it to go up” – obviously there are some cryptoassets which pay dividends in a manner similar to any dividend paying stock or share and the technology is producing efficiency gains. Not all cryptoassets have a purpose, but lumping the entire sector together as one is another generalisation that does not bear out. It also ignores the fact that what many projects produce is the ability to bypass other institutions - the production is the absence of fees or other negatives which other intermediaries may enforce. The 'production' of a PoW cryptoasset such as Bitcoin, for example, is the security of the network which enables anyone to use it worldwide. Berkshire Hathaway will be remembered long after Warrant Buffet and Charlie Munger’s deaths as a true success story, even if the vehicle has long been at odds with Buffett’s words. Where Buffett preaches raising taxes, Berkshire Hathaway pays minimal proceeds. While he endorses the free market, his businesses benefit from oligopolies and micro-monopolies. Berkshire Hathaway has relentlessly cut costs (and jobs) and taken money out of the businesses they own and into their own pockets. In this context it is hardly a surprise that Buffet has said that “If you buy something like bitcoin or some cryptocurrency, you don't have anything that is producing anything”. Bitcoin is pretty much the exact opposite of what Buffett looks for in an investment – and this is fine. Bitcoin and other cryptoassets aren’t for everyone, an 85 year old man who ranks as one of the richest men on the planet and who would be unable to invest even 1% of his wealth without causing steep rises in prices probably isn’t the target demographic. But Munger’s comments that “Bitcoin is worthless artificial gold, which if succeeded, would sell to hit a lot of illicit activity... I think it's a scumball activity” and likening them to faeces is so intellectually bereft it is not worth responding to. This vulgarity is a common theme. Why is it that all these powerful and obviously intelligent men are unable to elucidate why they are so disdainful of Bitcoin? Why do they resort to insults and blanket statements? They make arguments that even the most simple of critics have made many times over. They resort to insults. They do not understand the most basic of aspects about what cryptoassets are, what the industry looks like and what it could one day be. Their inability to separate the technology from the cryptoassets, the scams from the innovative, the potential from the dead ends is a sign of a lack of curiosity. This lack of interest is fine – just don’t make me read yet another article demanding that I care about their invalid, boring and redundant opinions.